David Brin has an impressive resume as a scientist and scholar, and could probably have stayed comfortably in those careers all his life. Instead he expanded his aspirations into writing with this first science fiction novel. I can imagine him thinking about where to place his story, something that hadn’t been done a thousand times before. His solution: a human (and alien ally) expedition into the upper layers of the sun! Brilliant idea. “Sundiver” is the first part of the first Uplift Wars trilogy. I’ve already read the second and third ones, “Startide Rising” and “The Uplift War,” so have read them out of order. I don’t think it harmed the impact of any of the books, though this one does begin on a future Earth, and perhaps would have made some things in the later books clearer. Through backstory we learn here that an Earth expedition into deep space had encountered a vast and sometimes chaotic galactic civilization, tied together loosely by common knowledge and ancestors. Common knowledge is shared through the galactic Library, available to all sentient races, and to their “clients,” races on the verge of civilization that the older races take under their care to educate and “uplift” them to the level of full membership. Earth is a very rare “wolfling” civilization, coming to the party apparently on their own and without a sponsor, though the older galactics insist they must have had one who left them too early. Another unusual thing about Earth is that they have, unknowingly, acquired clients of their own. Through genetic manipulation and individual training they have undertaken the uplifting of chimpanzees and dolphins, one thing that seems to qualify them for galactic citizenship. As the story opens, the protagonist, Jacob, is seen training one of the dolphins. Then he is offered a position on a research mission to Mercury, where probes are being sent into the upper layers of the sun. There, he finds out, are living beings of some unknown gaseous construction that are setting both Earth and Galactic scientists into a frenzy. Are these the fabled lost sponsors of Earth? Or something else? When Jacob gets to Mercury he is swiftly drawn into a complex intrigue involving sabotage and murder. Jacob’s own background will provide tools to help him sort out the mysteries and menaces all around him. Brin’s first book is extremely complex and thoroughly imagined, yet exciting and very readable. It’s easy to see how his career took off in meteoric style after this book, with the second in the series winning both the Hugo and Nebula awards for best novel. This is a great read full of fascinating concepts and characters. Highly recommended. This entry was posted in Books, Reviews on March 9, 2010 by Todd. 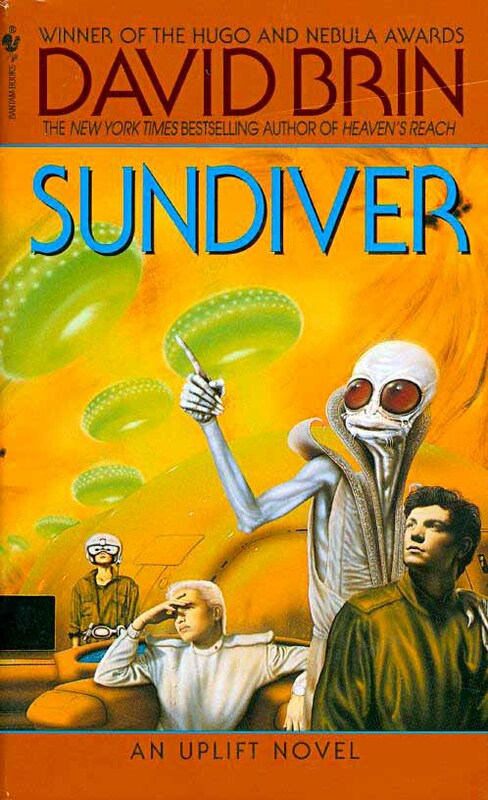 Sundiver was Brin’s first novel, and, from reports, the one he likes the least — but in my opinion, it’s the tidiest, tightest bit of storytelling in the Uplift setting, and the one that would make the best movie. Alas, every Brin adaptation project I’ve heard about conceerns The Uplift War, instead.